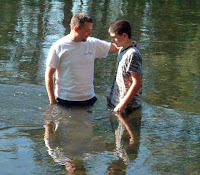 Treasure Chest - a voice of New Life Church in West Linn, Oregon: Baptism Tomorrow! Just a reminder, this Sunday, August 3rd, we will be gathering at the Haugen’s house for an outdoor baptism. Nine people will be following Christ in baptism! This will be a great time of encouragement, celebration, and fellowship. The worship and testimonies will begin at 4:00 p.m.
Click here for a map and directions, please carpool and bring your own chairs if possible.